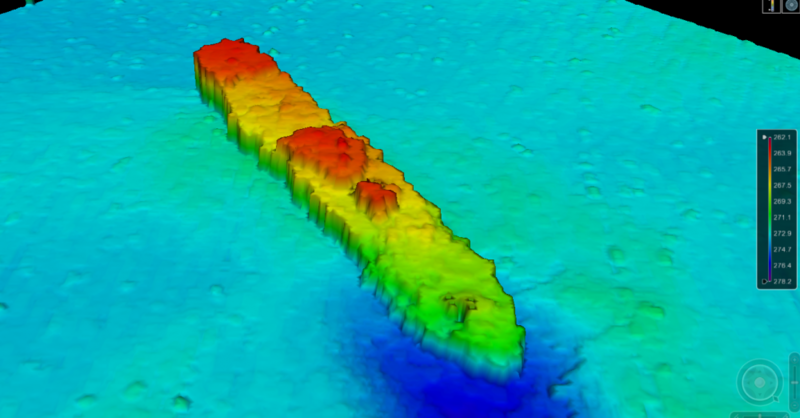 3D acoustic image of the wreck of the Carolus captured using a RESON 7125 SV2 multibeam echo sounder. Source: CIDCO. Photo of the Carolus. Source: Roland Berr. 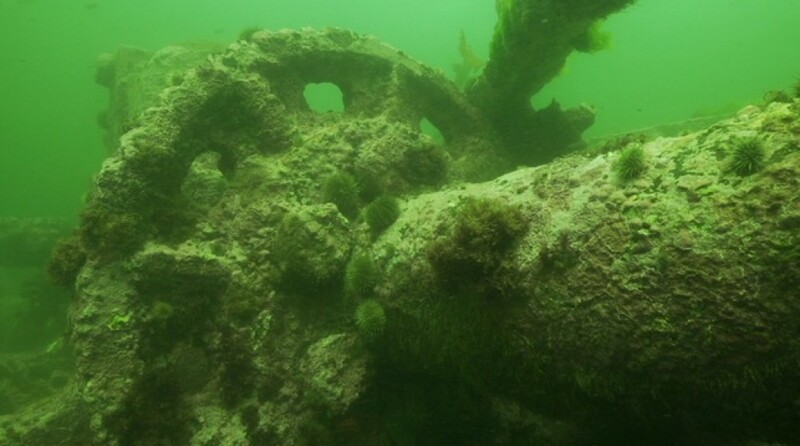 This World War Two wreck is the reason Samuel Côté first became fascinated by shipwrecks and the Battle of the St. Lawrence. In 2006, he identified the wreck of the Carolus (found in 2006 by the Canadian Hydrographic Service [CHS]) in the Bas-Saint-Laurent region. 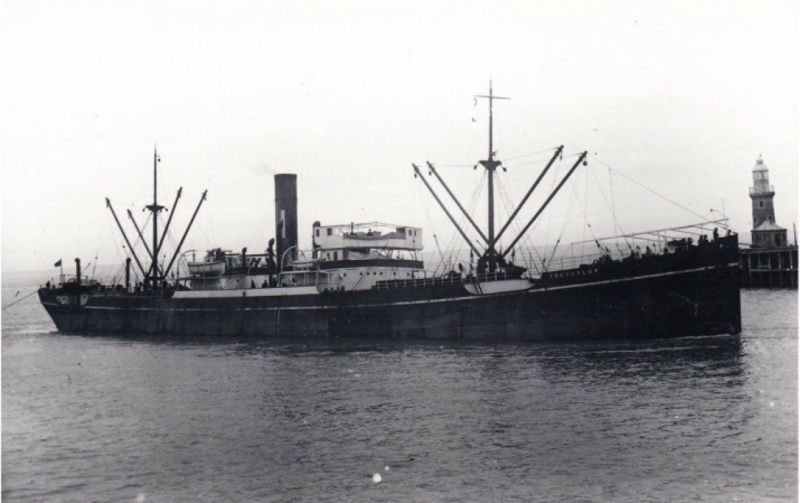 The merchant ship was torpedoed by the U-69 (a German U-boat) on October 9, 1942. It was the furthest point west on the river that the enemy attacked during World War Two, and caused the deaths of 11. 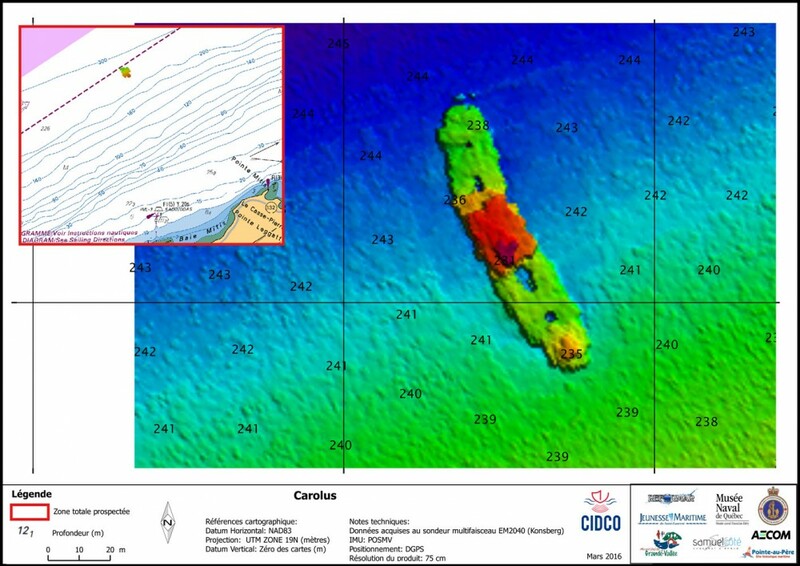 The CIDCO (Interdisciplinary Center for the Development of Ocean Mapping) team mapped the wreck of the Carolus in 2013 and 2015 (data collected for this project and the Knowledge Acquisition Wrecks St. Lawrence project). Below are some acoustic images of the wreck. 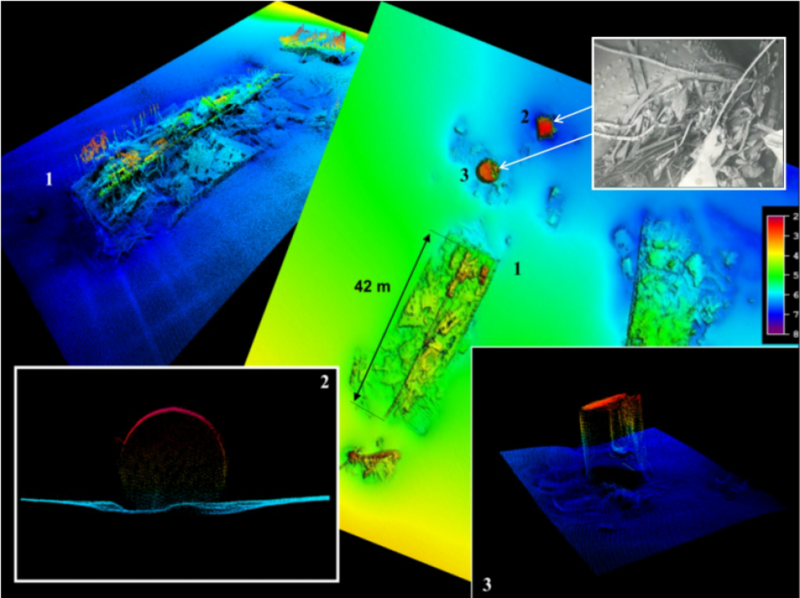 3D acoustic image of the wreck of the Carolus captured using a KONGSBERG EM2040 mulitbeam echo sounder. Source: CIDCO. 2D acoustic image of the wreck of the Carolus captured using a KONGSBERG EM2040 multibeam echo sounder. Source: CIDCO. On the acoustic images you can see that the wheelhouse and upper deck have become detached from the main deck, you can also clearly see the four holds. The images clearly show where the torpedo struck the ship, as the Carolus was hit on the port side behind the wheelhouse. 3D acoustic image captured using a KONSBERG EM2040 multibeam echo sounder. Source: CIDCO. In 2005, the Canadian Hydrographic Service (CHS) discovered the wreck of the Nicoya. This was one of the first ships sunk during the Battle of the St. Lawrence (May 1942). The U-553 fired two torpedoes at the ship when it was north of Pointe-à-la-Frégate. 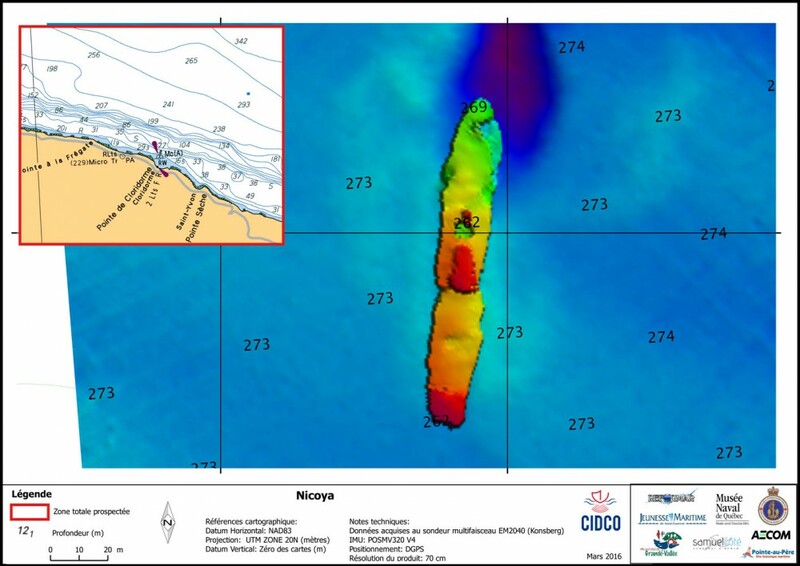 In 2015, the CIDCO team mapped the wreck. Below are the acoustic images. 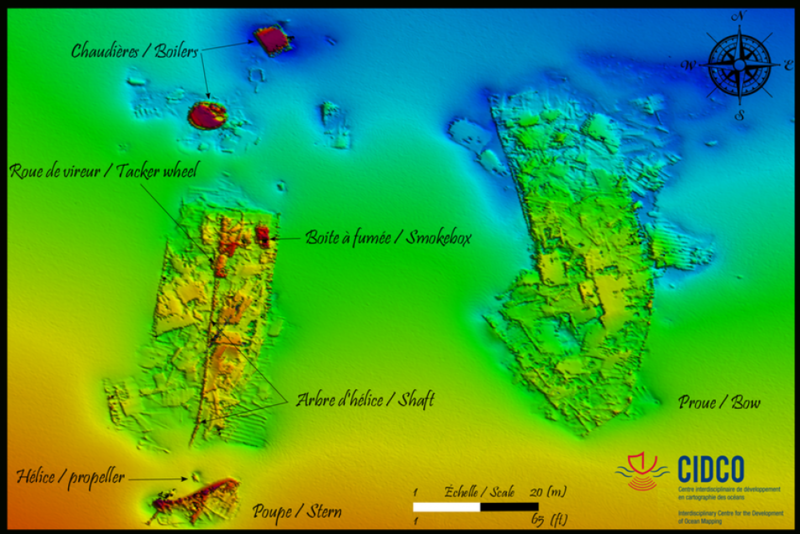 2D acoustic image of the wreck of the Nicoya captured using a KONGSBERG EM2040 multibeam echo sounder. Source: CIDCO. We were able to use this new acoustic data to take more precise measurements of the ship and better identify certain details, such as the wheelhouse, a funnel or mast, one of the two holds, the protuberance of the stern and a damaged bow on the starboard side. These details made us reconsider the wreck’s identity, however the alternatives were too similar to the Nicoya, and our data was not detailed enough to definitively judge the wreck’s identity. 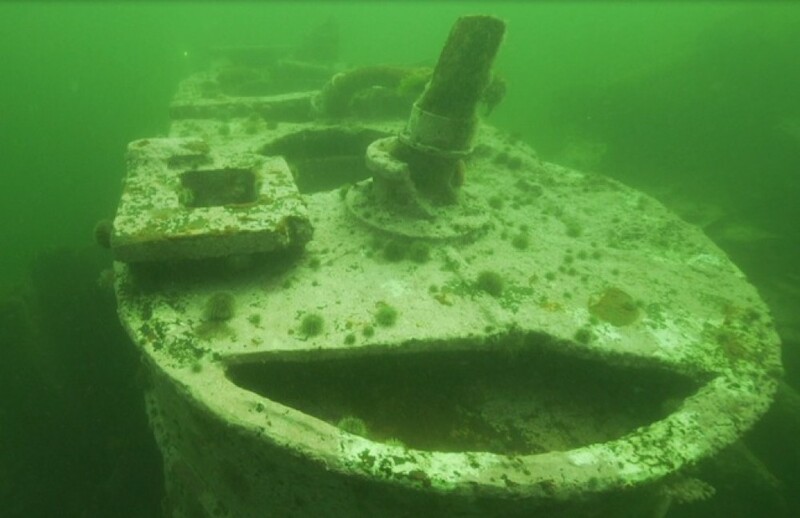 The only way to solve this question was to explore the wreck up-close. 1. Stern 2. Cylindrical boiler 3. Cylindrical boiler. Acoustic images captured using a RESON 7125 SV2 multibeam echo sounder. Source: CIDCO (data collected for the Knowledge Acquisition Wrecks St. Lawrence project). Top right photo: Photo taken in the Frederika Lensen’s machine room a few days after it was torpedoed. You can see a cylindrical boiler. Source: Library and Archives Canada. On July 20, 1942, the Frederika Lensen was en route to Sydney, Nova Scotia, when it was attacked by the U-132. 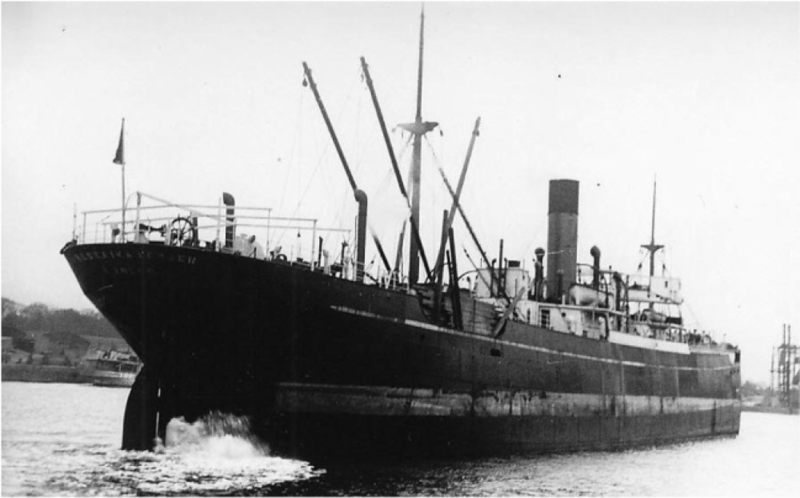 Four crewmen were killed instantly and the order was given to evacuate the ship. The ship remained afloat and was towed to the Bay of Grande-Vallée, where it eventually sank. 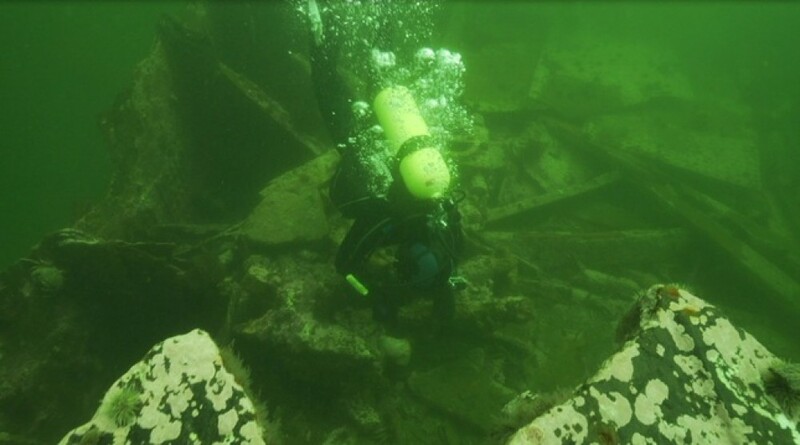 In 2014, CIDCO mapped this wreck for the Knowledge Acquisition Wrecks St. Lawrence project. Acoustic images captured using a RESON 7125 SV2 multibeam echo sounder. Source: CIDCO (data collected for the Knowledge Acquisition Wrecks St. Lawrence project). Smokebox. Source: Érik Phaneuf and URBANIA TV. Tracker Wheel. Source: Érik Phaneuf and URBANIA TV. The Frederika Lensen run aground in the Bay of Grande-Vallée. Source: Library and Archives Canada.